Why so few 3-patterned optical illusions? It is of some interest for those who are serious about the study of tripartite ideology, in its broader- defined form, to make note of the persistent predominant usage of two-patterned optical illusions in psychology, psychiatry, counseling, etc., and question why there is not a larger sampling of three-patterned images (or ideas), though there are a few observers who can sometimes readily see three images even though most others only report seeing the two variations as described by those who ask the question of whether or not someone can see two separate images. The existence of such two-patterned optical illusion examples illustrate the continuance of an out-dated way of seeing/thinking and expecting what others should see/think as well. The usage of such examples as "tools of the trade" in various forms of psychology (popular culture, academic, clinical) are akin to the usage of stone-age tools in the presence of those whose (world-view) consciousness is geared more-so towards advanced technology, which, in analogy to stone-age tools, can be simply referred to as the usage of iron-age tools. In other words, those who use two-patterned references expect others to have a similar type of (limited) mindset that is focused on a two-patterned world view, and are customarily unaware of the existence of an underlying (and overlapping) trend in growth of human consciousness that is individually expressed in various ways because there is no present day socialized means of focusing this type of mental (growth) activity in a fundamental way as we do when focusing the mental activity of growing children towards the adoption of ideas such as 'Reading, 'Riting, 'Rithmetic. Indeed, the expectation for people to focus on a recurring usage and interpretation of two-patterned ideas such as is exemplified in the presentation of two-patterned optical illusion images (or two-patterned ideas that are not necessarily accompanied with images such as Heaven/Hell, Good/Evil, Rich/Poor, Upper class/Lower class, etc.,) particularly those individuals whose consciousness is developing beyond customary parameters, is like expecting an adult to continue sucking on a pacifier... regardless of the popular psychological notion that people who smoke are symbolically engaged in such infantile behavior. "What is meant by the idea that a rolling stone gathers no moss?" What the typical person is "supposed to say" is something to the effect that nothing can grow on a moving stone, which in reality is a reference to the distinction between the opposites of movement and non-movement. Likewise, the typical person is "supposed to look" at the following images and make a similar two-patterned distinction between one (or both of the) two references, because to not do so, may be interpreted as an indication of some underlying emotional, physical, or mental issue that is deemed less than what is customarily considered to be normal, even though there are a lot of customarily un-normal perspectives when some people are asked to say what they see in the images. "Is this not a place of so-called higher learning, and we are expected as well as permitted to think outside the box...to make new inferences, new associations, to adopt an attitude of pattern recognition, from which new discoveries may be made that might be of long lasting benefit to humanity?" In effect, my comment was a socially accepted means of acquiring permission to think, view, and say things that were not customarily accepted and expected. I have found this same act of needing to "ask for permission," in its various social guises, to be an (unspoken) expectation even in settings in which there is to be unrestricted ideas offered such as in brain-storming sessions! In almost every socialized so-called "creative" situation I have been in, there is someone who attempts to define the limits of what is and isn't going to be accepted as a creative expression ...sometimes because they don't understand, sometimes because an idea produces circumstances which interfere with their presumed dominant role, and sometimes because the idea is so good they want to use it for a personal agenda in circumstances outside the group. The instructor had used masking tape to outline a large box on the floor. It was large enough so everyone could fit easily within the square. After we had all gotten into it, the instructor made the box a little smaller. Each time he did this, the box got progressively smaller and everyone had to squeeze closer and closer together in-order to fit into the box. When the box got extremely small, I stood outside the box and watched all these so-called educated experts fight over a position inside the box. Some of them were particularly aggressive and were determined to have a position in the box! As I stood outside watching, some of them began to ask that I join them. When I refused to, some of them got down-right hostile and began to DEMAND that I join them. I still refused to join them in their box and said that outside the box is much better. Some of them argued that I wasn't "playing the game" the "RIGHT way." When their various attempts at peer pressure did not work, the instructor smiled at me and asked the class to return to their seats. He explained that I was the only one who had been courageous enough to think outside the box. Everyone else, forced themselves to comply with a standard of behavior and thinking that they thought was normal and did not appreciate the fact that the whole social scenario was contrived as an experiment, (just as Democracy, Religion, etc., are) and the way they interact with peers, patients, and everyone else they meet. However, such comments only made some of the participants even more resentful of me for being different. This resentment carried-over into future dealings with them to the extent I was intentionally cast in the light of being an "outsider." In future meetings with them, my views were violently attacked, and they used every source of social maneuvering to make me appear that I was someone less than them. I was called names, avoided in hallways, and was even transferred to different positions three different times! Talk about holding a grudge like some bullying adolescent who accidently got their toes stepped on! If they see one item or another item. If they see one item and another item. 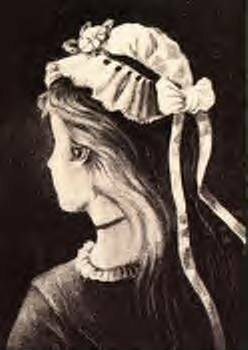 It is frequently found that the illusions are provided in a two-patterned drawing of white and black, though a few colorized versions can sometimes be seen. It is also frequently found that the participant is asked to make some two-patterned White/Black or Black/White distinction of geometrically labeled forms such as lines, circles, squares, triangles, etc... It can further be found that on some occasions, the participant is asked to stare, for a period of time, into a white or black portion (such as the middle of a page), in-order that they might perceive some view (such as spots, dots, or circles) in the opposite color than that upon which they are told to stare. Old man or Kissing couple? Two faces or One face? Two faces or a goblet? Straight or Crooked Horizontal lines? Straight or Crooked Vertical lines? 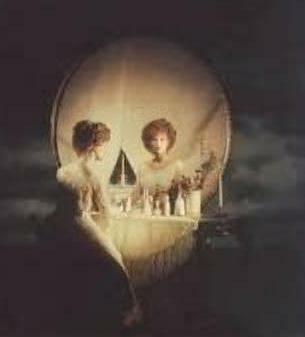 Skull or woman in mirror? Opened towards or away from you? Which (mouth) line is wider? Is the Hat taller or wider? Is this a Man or Woman? Canadian Flag or 2 brow-butting people? Face on Mars or Mountain range? 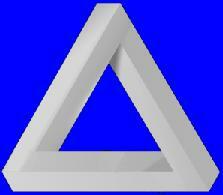 Twisted or not twisted triangle? Inside or Outside cross beams? Concave depressions or Convex spheres? Same size or different center circles? Is the phrase correct or not? standard scoring approach with increasing objective scoring research studies; establishment of age, gender, socio-economic, culture, and other norms; and reliability and validity studies..." in the future use of the TAT (Abrams, 1999, p. 153). Lastly, the cards, themselves, have been criticized for being anachronistic and overly gloomy limiting the range of affects, motives, and capacities able to be assessed. are being offered to the unwitting as a sophisticated, almost magical way to understand our deepest natures and our personality type. In actuality, Christians (and others) could be unknowingly lured into the occult by practicing the temperaments and other New Age personality typologies. persistently deny any problems or distress. 5 are in black and white. 3 in black and red. WHITE: white eyes, white sperm, white mucus, white skin, white hair, etc. Scoring is (two-patterned) based on whether response is to the "whole" of what is seen in the inkblots or to the "parts." Psychiatrists and Psychologists consider it a reliable method to uncover signs of brain damage and neurologic pathology. Bizarre responses may only indicate creativity or capriciousness or may indicate autistic thinking or a schizoid tendency. Notice that inkblots are two-patterned in the sense that they are mirror-image representations of the other half. How ludicrous it is for a three-patterned perspective individual to be tested by a two-patterned methodology and those whose mindset is two-patterned focused!... and they're not even aware of it!!! Continuous- more complete in structure. In a word association test, it is commonly viewed that when words such as UP, BLACK, or IN are presented individually and sequentially to a participant who is asked to say the first word which comes to mind upon hearing these words, there will commonly be heard the (two-patterned) opposite of DOWN, WHITE, and OUT. Depending on the person who is "assessing" (judging) the results, the test taker's remarks can be interpreted in a positive, neutral or negative light. Quite typically, the test giver is one who may have an average or even below average I.Q., along with a so-called "normal" or average wisdom, insight, creativity, and knowledge base. I don't care if they say they have a PhD. Many of them are PhD-ed idiots. Imagine, someone with a PhD trying to assess the so-called normal rationale of a person's psyche with a two-patterned test in a dominant three-patterned oriented culture! Most often, the test giver is not aware of their own culture's proclivity to put perspectives into groups-of-three, (or whatever) even when the test giver themselves are subjected to the same culture! They're expecting a person with an underlying three-patterned dominant psyche to express themselves with "expected" two-patterned (dichotomously arranged) comments! What absurdity! i don't care what sort of reasoning they adopt to defend their stupidity. It's still nonsense. I have to find any test giver who is aware of numerically identifiable proclivities, though they themselves use such themselves everyday! In addition to the above two-patterned examples, it should be noted that the two- patterned concepts of qualitative versus quantitative research and subjective versus objective tests are additional recurring themes in the psychoanalytic field. Word Association Tests, where the respondent reacts to words with other words; the respondent may also show signs of anxiety and some kind of apparatus is often used to measure emotional state. Thematic Apperception Tests, where the respondent makes up a story around the people they see in a picture... the assumption is that they will project their problems on to the people in the story. 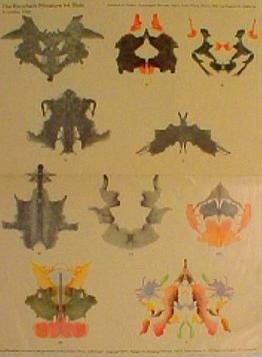 Rorschach Inkblot Tests, where the respondent tells the tester what they 'see' in the inkblots. Cattell's 16PF (Personality Factors) Test, designed to rate people according to Cattell's list of sixteen personality factors. Eysenck's tests as presented, for example, in his book Test Your Own Personality. The MMPI-2 (Minnesota Multiphasic Personality Inventory - 2) which consists of 567 statements, which subjects either agree or disagree with. These are primarily used for people receiving therapy. Though I have presented a few examples of two-patterned ideas concerning illusions and some tests used by counselors, psychologists, and psychiatrists, it must be mentioned that there are tests which explicitly outline a pattern of three such as the H-T-P: House-Tree-Person Projective Technique, to give but one example that is easily identifiable. Nonetheless, there are relatively no tests which are designed to evaluate differences in cognitive development with respect to a 1~ 2~ 3 maturational development sequence, mainly because such an idea is virtually unrecognized by most test givers. They are not aware of the idea about the individualized occurrences of consciousness development. In analogy, it is like a person skilled in voodooism administering a test to an individual whose mind functions at a level of modern medicine even though they have not had formal training in medicine and there are no existing socially recognized formal training methods that they could learn from, and yet they are expected to adopt the usage of voodooistic nonsense in-order to be "normal," socially acceptable, and a contributing member of the prevailing society. In other words, the tests are inadequate, the test givers are inadequate (even though they may be recognized as the foremost experts), and the social/environmental conditions under which the person is expected to "perform" are inadequate. Here are a few of the links for the above optical images and information. Since the information was compiled back in 2004, I can not guarantee all links remain viable. I will update all the links when I am able to.